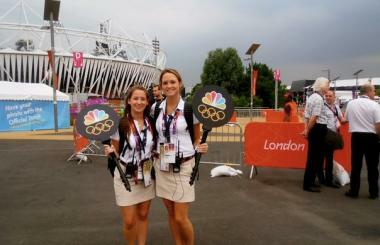 Keely Cashen (left) as an intern during the 2012 Summer Olympics. Keely Cashen, a marketing major and mass communication minor, got to see the city of London during the 2012 Summer Olympics not as a tourist, but as an intern with NBC. Cashen’s aunt, Blaise Cashen, works for NBC in event planning and recommended her for the internship. The internship sent Cashen an introductory e-mail telling her that she had been accepted for the program. After filling out the initial paperwork, she let the internship slip to the back of her mind so she could focus on school. A few weeks before she was supposed to leave for London, a large packet arrived. Being in the heart of London during the Olympics was exciting, but Cashen remained professional. She was responsible for escorting guests, leisure tours, and parties, working the ticketing, information, and tour desks, and assisting the senior office staff with various activities. She admits that maintaining a professional demeanor was challenging at times, especially while she was surrounded by celebrities and other important people. However, when she wasn’t escorting the guests from one venue to another and had time to herself, she notes that they were allowed to ask for pictures as long as they did so in a professional manner. Cashen got to see many of the Olympic events when she and fellow interns escorted guests to them. She was present for the opening ceremony and recalls how touching it was for the British citizens who were present. Cashen was also present for women’s and men’s beach volleyball, women’s and men’s gymnastics, and the triathlon. She went to the basketball event and got to see the United States win the gold medal game. During swimming, she got to see Michael Phelps, which she enjoyed because he is also from Baltimore, near Cashen’s hometown. Cashen is from the suburb of Towson, Md., where she grew up in the same neighborhood as her dad. After she graduated high school, she wanted to break out of her small town and go somewhere new. This prompted her to apply to Loyola University New Orleans, which gave her a larger scholarship than any other college she applied to, which her parents were pleased about. Cashen enjoys meeting students from Loyola who hail from all over the globe. She also loves the endless restaurants and places to go in New Orleans with her friends. Cashen wants to continue exploring the world around her. She’s been to France on two separate occasions. When she was younger, she vacationed with a friend in the south of France and has been skiing in the French Alps. She says that after graduating she would like to stay in New Orleans for another year. She would also like to visit Japan since she took Japanese for three years in high school and briefly at Loyola. She worked as an intern for Gambit, a local newspaper, after her time with NBC and used many of the skills from her previous internship there. She loved the responsibility she was given. Cashen says that working with NBC provided her with hospitality and customer services skills and encouraged her to go above and beyond the call of duty every time. Recently, Cashen accepted an internship with Southwest Airlines in Dallas as an OCC communication intern. The internship required her to take a semester off of school and relocate to Dallas, Texas. Cashen says that Southwest Airlines was just named the seventh most admired company in the world by Forbes magazine. She also wants to apply to the Page Program, a year-long program with NBC which allows recent college graduates to gain experience in different departments. The pages are allowed to choose which departments they would like to try out, such as working on a six-week project in production, spending a couple of weeks on events, working in marketing, or working on a project in NBC Sports. View a photo gallery of Keely Cashen's experience at the 2012 Summer Olympics. View the complete spring 2013 issue of LOYNO.